Kingfisher starts Intl ops to SFO and Europe, and DN starts ops to the gulf. New airports at BLR and HYD - without proper connectivity from the city centers! Expanding intl ops at BLR - with IT launching non-stops from BLR, and maybe LH/AI connecting BLR with MUC. QR, EY start ops to BLR. 7. Land Aquisition will start at CSIA for the Integrated Terminal, garnished with Protests, Marches and VoteBank Politics. Finally, in the 4rd Quarter 08 or in 2009, Actual Work will start. U know how GOVTs Work! 8. Navi Mumbai Airport's Construction will start. But even that won't be Easy. Again Problems will be Land Aquisition, Tendering, Court Cases, Retendering, & finally a Selection amids hue and cry. Where's the End to this tunnel of problems??? Who knows, another Case!! 9. Gagan will go Live! No more Chakkar pe Chakkar. 10. AI will begin reconsolidating its lost Ground, & start climbing up the ranks. (Atleast as far as Hardware & Inflight Service is Concerned). It will place another Huge Order with a few A380s, 787. BOM-JFK, BLR-SFO, DEL-JFK Nonstops will help regain its lost Pride. HYD, BLR and MAA might see some Operations to the West with 77Ws. Some AI MROs will come up. AI may pick stakes in some Airports for *A. It will be curtains on the B743. 11. New Rwy & Termnal will open up at DEL. 12. Jet will start seeing even more Revenues comin from INTL Operations, & might place another Order, this time a big one. Shanghai, SFO will start. Shockingly, what about FRA, CDG,etc?? R they not Interested? 13. Kolkatta, Chennai Airport Modernisation may Kick off. Gud News, KCM!! 14. Cargo will start Booming when Flyington starts Freight Operations with A332Fs. 15. Paramount will spread its wings to West and North India with Embraers, SpiceJet will grow its network with the B738NGs on Order. It might even fly Overseas due to foreign stakes in the Company!! 16. Lufthansa Technik will mark its entry into India with a new MRO centre at the New Hyderabad Airport (GHIAL). 18. MIHAN's Cargo Hub at Nagpur might just start business if things go on Schedule. 19. The so many Flying Schools in India will truly start Churning out the required no. of Pilots after the 2005-06 Boom. But, Commanders will still be Out of Sight. Until, AInet Pilots come to their Rescue. 18. More CX flights to the East & West from DEL, BOM. Terminal 1C will be located between 1A & 1B & the Cargo section at Domestic Terminal will shift. More Slums will be cleared & members relocated. Flying ton freighters with A300s & Quickjet with B733SFs will start ops. 12. Jet will start seeing even more Revenues comin from INTL Operations, & might place another Order, this time a big one. If what i heard is correct expect a significant order of unexpected aircraft from 9W at no other place than Faranbrough itself. Hint---Double deckers----hint ---Xtra Wide Bodies. is it the A380 or B748? 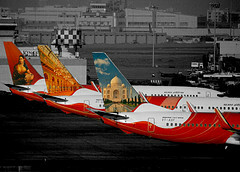 Air India will keep talking about starting new flights to Lima, Santiago, Brisbane, Casablanca, etc. even as options like BLR-SFO, BOM-ORD, MAA-LHR continue to fester on paper. Even more Malayalees will be stuck at airports across Kerala and the Gulf because of delays and more delays. Mallya will introduce a new summer uniform of red bikinis and stilleto heels for his cabin crew. The AI 744s will keep flying with their circa 1950 cabin interiors. QR and EK will link Gauhati, Patna, Lucknow, Pt. Blair and Leh with multiple daily nonstops to DXB and DOH. AI will respond with a twice weekly BOM-Pt.Blair-COK-DOH-BAH flight. The Communists will continue their brazen attempts at preventing India from improving its aviation infrastructure. AI's website will look the same come December 31, 2008. * more pathetic and hopeless reporting of the aviation sector by the media. * IT shall be having a tough time stablising themselves in the international market. * BOM airport might face some chokes from now and especially terminal 2A may become chaotic now with 2A now unofficially becoming jet airways terminal. * DEL will face even more congestion than ever before. * EU carriers into BLR will face a tough time with many gulf carriers entering BLR. * BA may start AMD or COK any one of them. * PNQ airport may acutally get their forst international carrier in the form of LH/UL/TG. Anyone thought of these ?! * Would Praful patel be the MOCA? * Would the DGCA chairs find new backsides?! * Will AI (NACL) find a professional chairman? * Would HAL Airport remain active? AI remains the worst airline in the world, and the GOI babus continue to run this airline into the ground. AI 777LR's gather dust and is mothballed at Victorville/Marana after delivery flight from King/Boeing field. Jet Airways continues to expand worldwide, introduces IAH-BRU-India flights and gets on multiple "best airline" lists. Indian passengers still act like drunk hooligans as the plane is taking off or landing. AI still has vociferous, blind apologists trolling this board and the "Indian aviation" on A.net to strike down anyone who criticizes AI. LH introduces FRA-Trivandrum/Cochin 3-4x flights. Sri Lankan airlines humiliates its bigger "cousin" AI by having great brand loyalty and schedules/reliability. Bonus points given as the country is in its 25th year of civil war. I, Texdravid, will mercilessly taunt, poke fun,and humiliate Air India, and just when it is had enough, drum up the teasing once again. Pledge not to stop until AI is dismantled or sold/privatized. And I , Nalini Dev , shall enjoy every bit of the taunt on AI !!!!!!! And I rhumbline pledge to defend my nation's flag carrier against all the mud slingers and naysayers. Great that makes it even more laughable !!! But, errrrrrr, mmm, like Rhumbline, even I remain Optimistist!! PS: Sorry Rhumb, I support u only till the LRs, Ws, Dreamliners don't become Rickety!! Thats the Last Chance for AI! ha leaving poor rhumbline alone in trouble times ... iye bahut galat baat haii!!! They won't become rickety any sooner than 9Ws or ITs big birds will, after all AI has the 'best' maintanence facility in the country. Even if they do get rickety I trust by now, AI knows how to fill up a rickety ol' rust bucket and keep it flying safely, better than other airline in the world. Way to go Rhumb.Cheers to AI and its future.. I'll quote your example for optimism to extreme levels next time. Rhumblinism:- telling the world the glass is nearly full even though it has just a drop of water in it. Rhumbline, I'm curious when you last flew Air India. Or dealt with their obnoxious, corrupt and incompetent reservations staff? And we offer our criticisms not as a matter of fun and games but as serious grievances based on recent real life experiences. We also offer praise when praise is due. In fact, most of us are far more lenient with praise for AI than with other carriers. Perhaps, it has something to do with the fact that its quite astonishing to see cabin staff, on occassion, perform as well as they do given the deck of cards they're given by management. If AI maintenance is so superb, why can't they get a simple overhead TV monitor to work when any local electrician from Gaamdevi or Matunga in Mumbai can make that happen in 10 minutes? Last time I traveled on AI (or IC whichever way you look at it) just yesterday IC915 BLR-HYD. Flight was as good as any other airlines on the domestic sector but without the IT a$$ shaking vixens . Beautiful glidescope approach and nice touchdown (imho the best A320 touchdowns on any airline in the world has to be with IC) so no reasons for me to complain as such ... though I have to admit my company made the reservations on my behalf. I too don't go around criticizing other airlines for the heck of it and offer praise when its due . It gets too much when the criticism is unprovoked - Live example Mr texdravid ranting around against AI a few posts up in this thread. Plus the praise is always accompanied by a snide remark and a sinigger or two. Its almost like people are willing AI to screw up and when it does all hell breaks loose. While the 9W/IT PR machinery conveniently glosses over all the negative stuff AI's goof ups get highlighted sky high. They are trying to make them operational but at the end of the day you can only flog a dead horse so much right. With the new fleet coming in things have already started to improve on the 321s and 777s. Rhumbline, from my understanding, IC's A320s are fairly good. And for all intents and purposes, its still IC. But when did you last fly one of AI's rickety A310s? Or even one of its rickety 744s? Or for that matter its leased UA 772s? so things will improve as far as passenger experience is concerned once the old/leased planes are phased out and the new birds start coming. You yourself posted quite positive comments about the BOM-JFK non-stop some time back. You are arguments are just a tad bit better than my naani ... she just says " no I cannot hear a word against AI and thats her verdict " , but her loyalty remains still as she never thinks of flying any other carrier than AI and off lately 9W. rhumbline you will never understand why we criticize AI and your defence is a big joke and is ridiculous to your degree of optimism. You should see how those AI b**stards make the labourers cry and harass them and SHJ/DXB airports. A member's mom here slapped an AI official. Tell me god forbids if this happened to your mom would you still praise AI? If your parents had to suffer , would you still praise AI? And this is happening for not one or two but for 15-20 years. why? the fleet replacement etc have just come in the past years. And yes we give due credit to the AI B77L , because it is good and value for money. Shell out 70 K rs from your own pocket for a tkt to ORD , and you show how to compromise on standards when other airlines at lower fares are a million times better. in marathi there is a saying " Jyachi jalte tyala kalte" . Ok enough of this AI bashing and defending I think we have hijacked the original thread. Well, you still haven't answered my question. When did you last fly one of AI's rickety A310s or its filthy 744s? And when did you last have to grit your teeth through hours of dealing with AI reservations staff? And, yes, I've offered praise to AI when praise is due. And I hope that the standards provided by AI's new 777 fleet will be the norm, rather than the exception. But until then, there is no reason why AI's existing 744 fleet can't be well-maintained both inside and out, and why the majority of its staff can't be civil to its fare-paying pax. How do you arrive at such an opinion? Have you been on a flight of every A320 operator? so I do expect them to land the things perfectly. Secondly I know the training standards maintained for the A320 in CTE (ICs pilot training establishment) where they tutor the correct glidescope approach and touchdown on all major Indian airports. the correct glidescope approach and touchdown. its glideslope... the vertical path to the runway... and yes IC might have some experienced pilots... but not every landing is a feather touch... ive had the worst approach on IT and the touch down was smoooth as hell! its all a matter of chance... yes skill is also a part of it... but as a pilot many things come into play to make it a 'perfect' landing... things like wind, runway conditions, speed, weight,etc. alll of it! Nope, but I base my opinion on the flight experience of IC commanders. Average command experience > 7500+ hrs on a single type of a/c (probably the highest in the Asia-Pac region certainly better than any domestic carrier) so I do expect them to land the things perfectly. Jokes aside, I highly doubt ICs A320s ‘smoothness of landings’ are better than 6Es or ITs or any other carriers for that matter. Every time their pilots do an approach I certainly hope they have an approach plate in front of them which has all the relevant normal info. Agreed, there’s nothing like being familiar with the entire procedure before hand, but I bet most good pilots will review all necessary procedures well in advance.